There’s always been something magical, and totally fall-like about the flavor combination of cinnamon and apples. Typically, these two are most seen together in desserts. 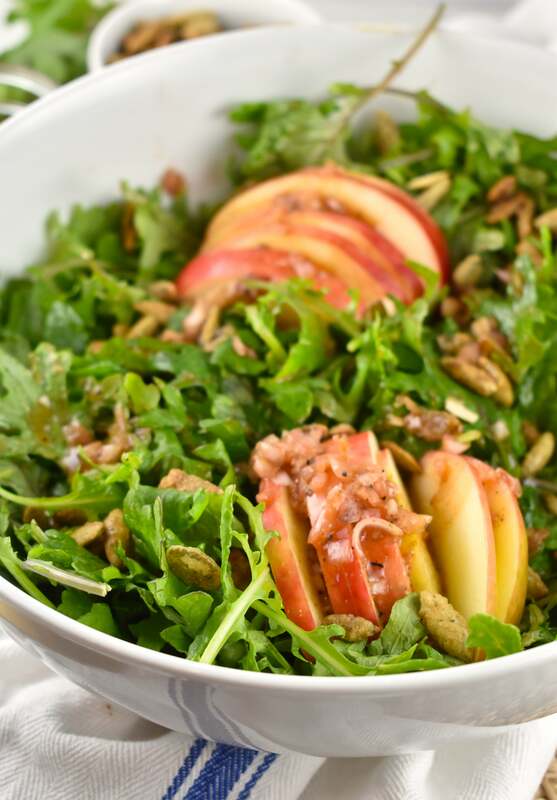 But in this Fall Harvest Salad, they collaborate in a more savory way that is absolutely and undeniably – mouth-wateringly delicious. 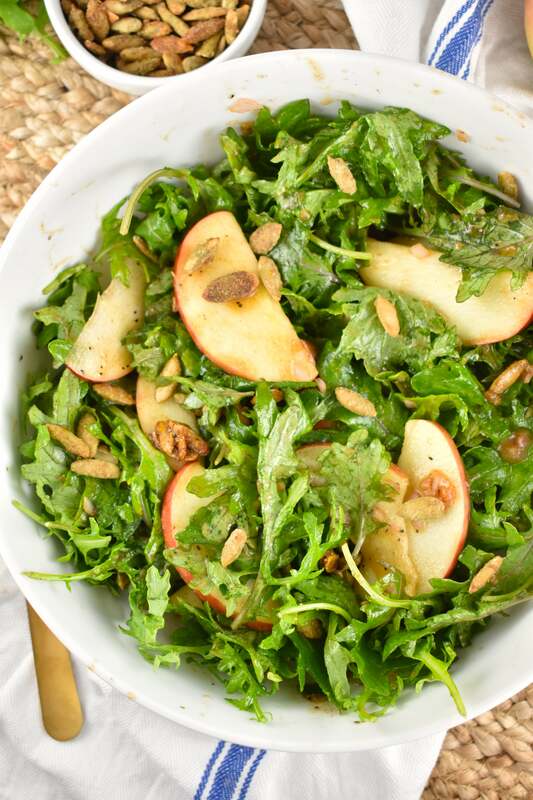 I started by using a very simple base for this salad – fresh baby kale leaves. You could use other type of greens, if you’d prefer. Like baby spinach. Or some beautiful Lactino kale. That lovely, rich, dark green color would create a perfect autumn aesthetic for this salad, and would look stunning on any holiday table. Then, I added some fresh, thinly-sliced apples. For the type of apples, I like to use something seasonal. Honeycrisp apples are wonderful this time if year (and my personal favorite apple ever). 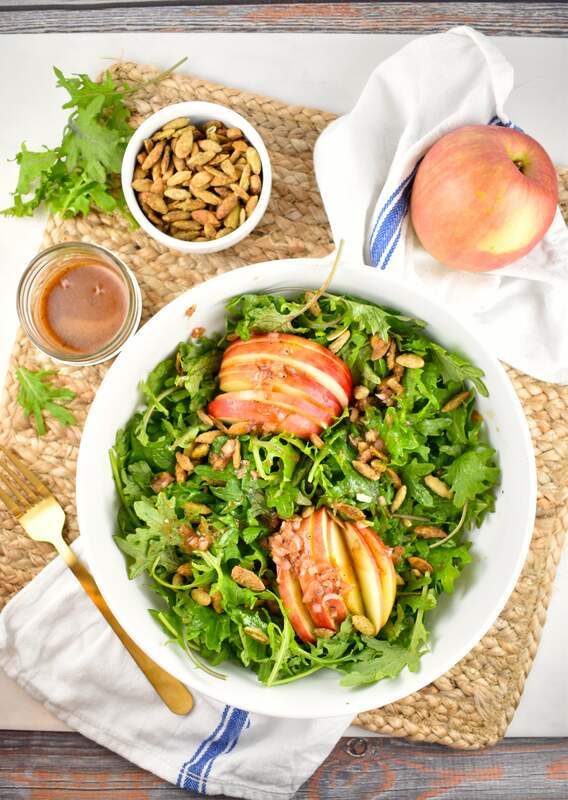 But I’ve also used fuji, pink lady, and braeburn apples on this salad too, and they work just fine. A problem with fresh sliced apples, is that once they are cut open and exposed to air, they begin to brown. 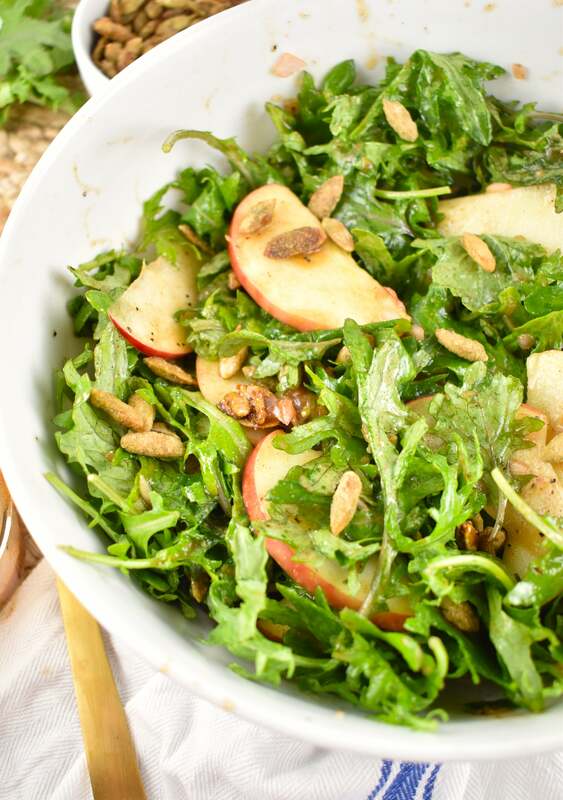 This can make your salad look not so pretty in a matter of minutes, so I’m going to let you in on a little tip that will help you avoid this problem, and keep your apples looking beautiful. Here goes. After you slice your apple, submerge the slices in a bowl of salt water. I mix about 1 tbsp of salt with 1 ½ cups of water. Stir it until the salt is mostly dissolved, then add in the apple slices. Let it sit for about 5 minutes. Then rinse your apple slices with water, and pat dry with a paper towel. It’s as easy as that! I’ve been doing this for ages with the apples in my kids lunches, and it’s never failed me. Plus, it’s cheaper and cleaner than buying those bags of pre-cut apples. I’ve tried a few different methods, but the salt-water trick has worked the best without making my apples taste funky. Now, to create some crunch and texture, I topped the salad with some of Trader Joe’s Pumpkin Spiced Pumpkin seeds. If you don’t have a TJ’s near you, any sweet-spiced nuts or seeds would work as an appropriate alternative, so don’t stress! I just happen to love these pumpkin seeds from Trader Joe’s, so that’s what I prefer to use. 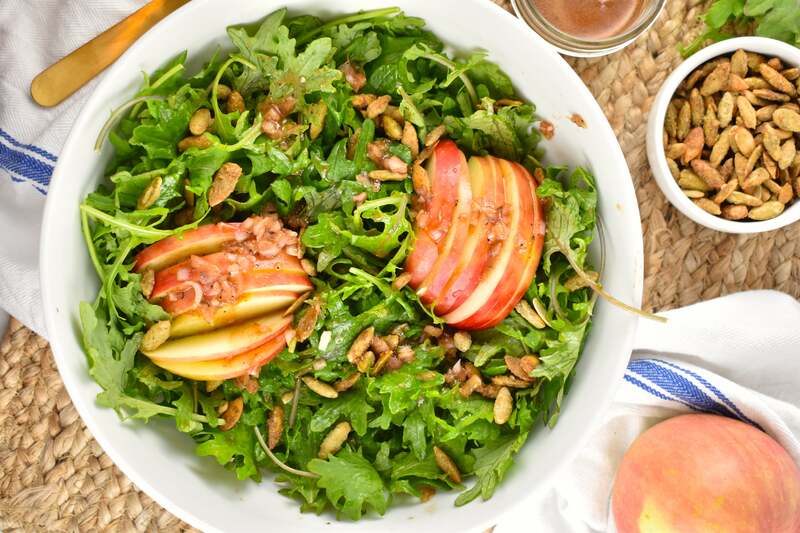 Finally, the game-changing step – drizzling a homemade cinnamon shallot dressing over everything. 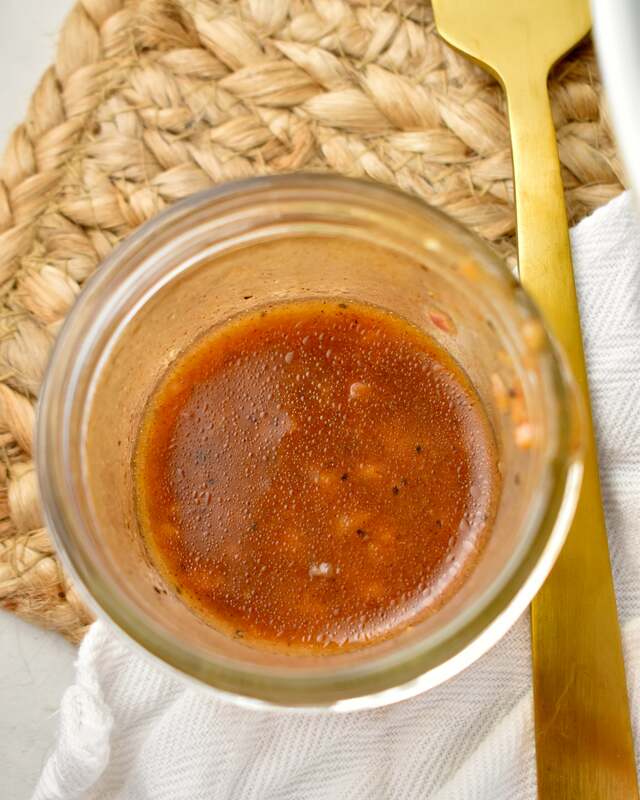 Who knew that a few simple ingredients could make the most divine vinaigrette I’ve ever had. 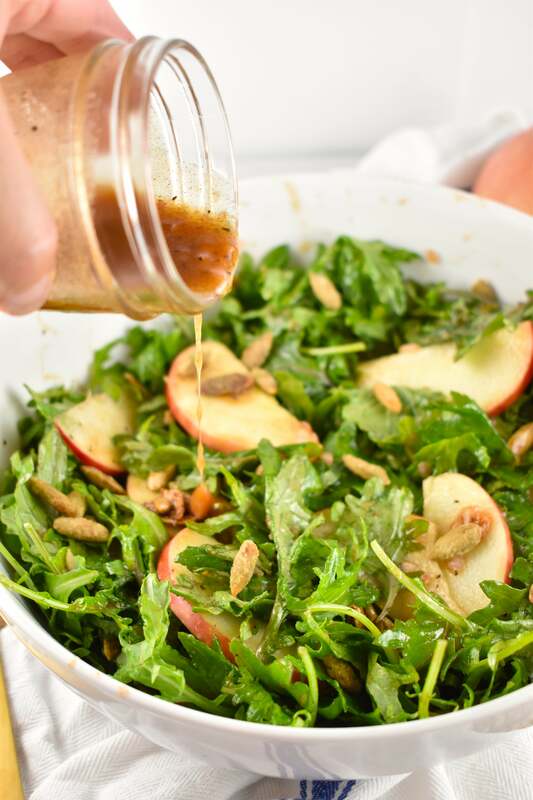 This dressing has the perfect combination of savory and sweet, and is the exquisite finishing fall touch to make this salad a delicious and gorgeous dish that is sure to complement your holiday meal, and impress your guests. CAUTION – you may lick the bowl. But that’s ok. I don’t judge. Try adding some grilled chicken breast to this Fall Harvest Salad, to turn a simple side salad in a more substantial meal. You could also top it with some freshly grated smoked gouda or white cheddar cheese, for an extra boost of deliciousness! LOOKING FOR MORE WW FALL RECIPES? TRY THESE! 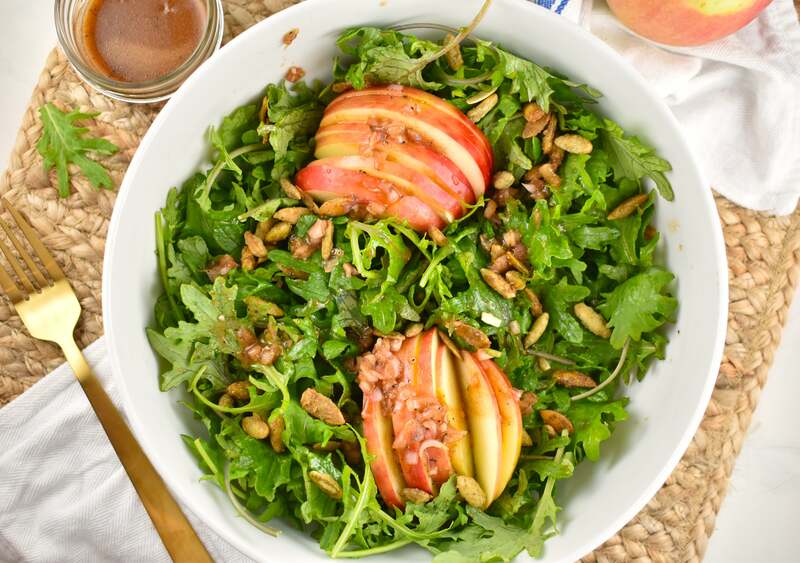 Beautiful fall flavors in an easy to throw together side salad. This gorgeous dish would be divine with any holiday meal! Pour dressing over salad, and toss to coat evenly.